The products you purchase to clean and maintain your boat can be harmful to aquatic life, water quality and human health. When you purchase boat cleaning products check the labels for words such as “danger,” “poison,” “warning,” or “cautions” that indicate the toxicity of a product. 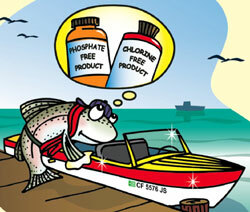 WHAT CAN BOATERS DO TO PREVENT DISCHARGES OF TOXIC BOAT MAINTENANCE PRODUCTS? Save major boat repairs and cleaning for the boat yard where toxic wastewater is collected for treatment and proper disposal. Choose less toxic cleaning products, such as non-phosphate, biodegradable cleaners. Click here to learn how to Find Less Toxic, Less Volatile, More Biodegradable Products. Use less product and more elbow grease. Reduce the need for boat soaps by scrubbing and rinsing with freshwater after each trip. Use canvas boat covers to keep boat clean between trips and reduce the amount of cleaning you need to do. Conduct maintenance work aboard your boat, not on the docks or over the water. Always mix paints, varnish, epoxy and other products over a tarp or in a drip pan to catch spills and drips. Keep absorbents nearby to wipe up spills. Plug scuppers to contain spills. Sand and paint large areas only in designated shoreside boat maintenance areas, using vacuum sanders with dust containment bags and high-density low-volume paint sprayers. For small jobs conducted in-water, attach tarps or visquine from boat to dock to catch debris. Reverse boat in the slip to work on the other side. Plug scuppers to contain dust, debris and spills. Check the new BOATER'S GUIDE TO USING HULL PAINT IN CALIFORNIA to assist you when selecting a bottom hull paint. This brochure provides an easy to read format that presents key considerations for boaters to think about when selecting a bottom paint. The goal of this brochure is to help boaters understand the available paint options and how the new information released by the CA Department of Pesticides Regulations regarding copper hull paints and regulations to address copper impairments (i.e., the new Marina del Rey and Newport Beach TMDL regulations) may impact a boater’s decision on the type of paint they may select. For additional information on non-toxic antifouling strategies for boats, consult the University of California Sea Grant Program. Don’t clean hulls that are so fouled that cleaning must be abrasive and is likely to result in paint removal and the discharge of toxic heavy metals. Perform hull cleaning in accordance with the manufacturer’s recommendations for the type of hull coating or bottom paint. Take zinc anodes back to shore and recycle or dispose properly.